£120 deposit/bond required. 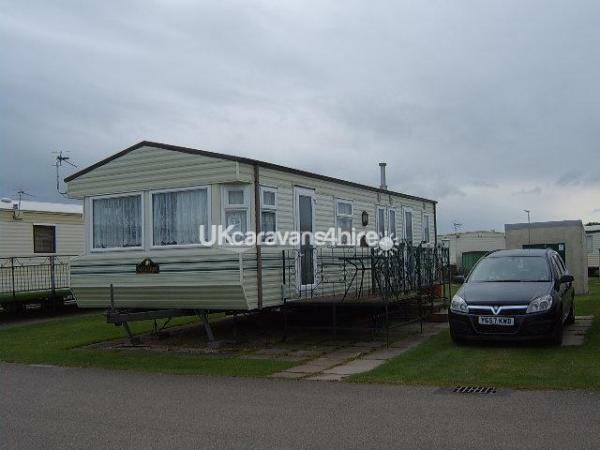 Refundable week after stay at caravan, if no damage found on inspection. Full payment required 6 weeks prior to booked holiday. Payment by instalments can be made, just ask. Upto 3 days short stay - £120 plus £120 deposit/bond, refundable as above. £180 for short stay on Bank holiday weekends plus £120 refundable deposit/bond. Sufficient coffee, tea, sugar and milk are provided for drinks on arrival. 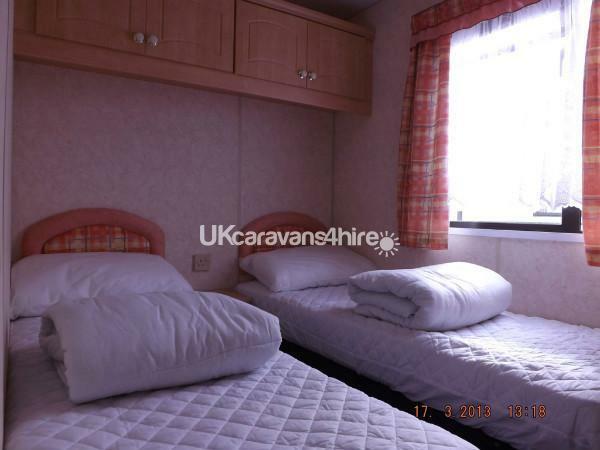 The caravan that is for hire is a fully equipped 8 berth. This year we are letting it out to sleep 6 people only. 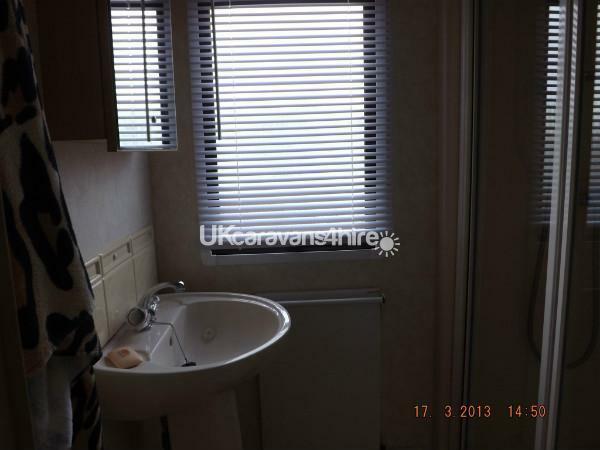 It has recently had double glazing fitted throughout. It has 3 bedrooms consisting of 1 double and 2 twin, 1 of which can be converted into a double. 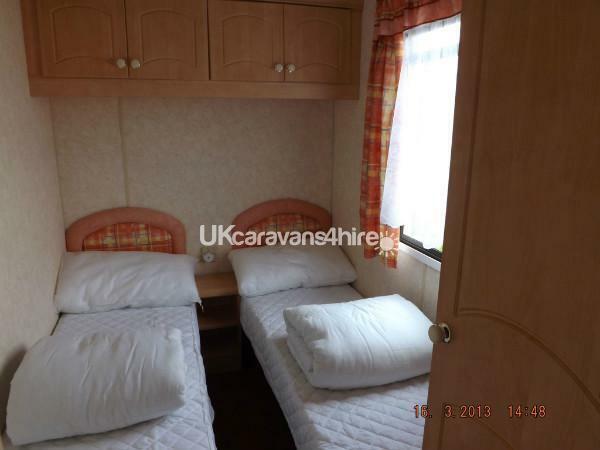 Each room has electric panel heating and plenty of storage space. There is an LCD Free-view T.V. which includes a DVD player and radio. We provide all clean bedding and protectors. 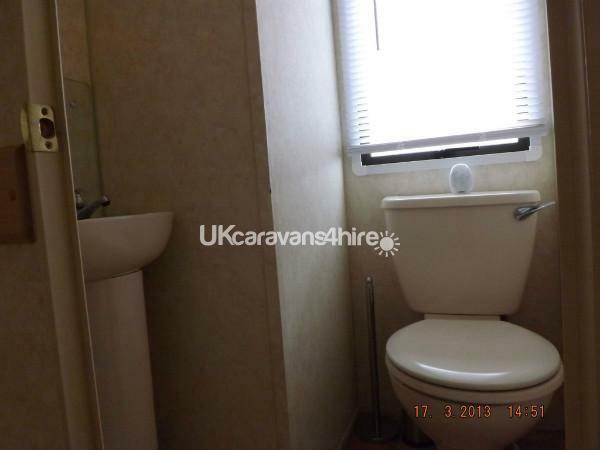 There is a separate toilet and separate shower room with an electric panel heater. A door separates the bedrooms from the lounge and kitchen area. In the kitchen/dining area there is a full size gas oven along with a microwave. The kitchen is equipped with all the necessary utensils etc (plates, cups, dishes, glasses, cutlery, saucepans, cooking dishes/trays and more and plastic ware for small children). There is a full size fridge with a small freezer compartment box in the top. 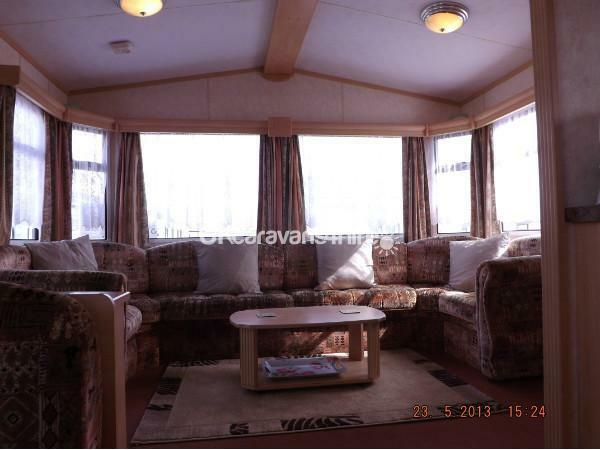 The caravan has recently had a new carpet and underlay fitted in the lounge and dining area. Smoke and carbon monoxide detectors are situated throughout the caravan. There is also a fire extinguisher fitted on the side of the kitchen cupboard. On the kingfisher site there is a grocery shop, children’s play area, laundrette, Council Office and Site Office. Close by there are plenty of take-away bars, amusements, shops, fish and chips and pubs. 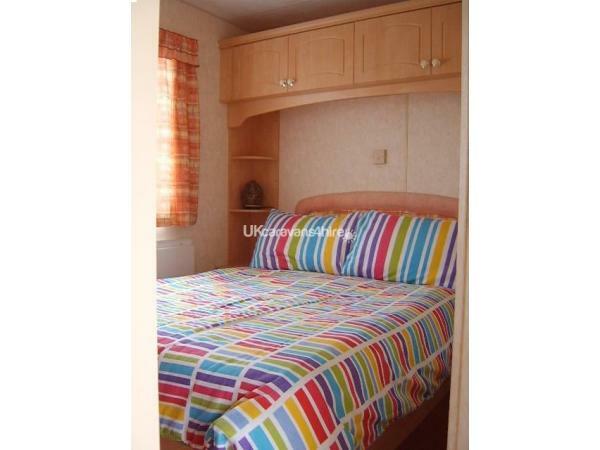 The caravan is situated in the middle of Ingoldmells so it is close to the market and Fantasy Island Theme Park. Skegness, Chapel St Leonards, Sutton on Sea and Mablethorpe are easily accessible by car or bus from Ingoldmells. There is a £120 deposit/bond which will be fully refunded in the following week providing no damage is found upon inspection of the caravan. The deposit/bond has to be paid on booking and the outstanding balance 6 weeks prior to your holiday. If you cancel you will lose your £120 deposit/bond. A Welcome pack will be sent out as soon as the deposit has been received. Deposits are usually done by bank transfer but cheques are also acceptable. Details are sent by text. The Welcome pack comprises details of the caravan, details about Kingfisher Park and the surrounding area. A Subletting form, which must be completed ASAP and returned to us (address will be sent by text) is also enclosed. A receipt for the deposit will be sent either by text or from this iPad. Additional Info: Shop, laundrette, children's play park, site office, council office, BJ's amusements, bingo room, cafe, lounge with entertainment. There are children's rides and play machines to win soft toys etc. There is also a burger van outside BJ's. There is a daily free train which picks up and drops off around Kingfisher Park. It is very popular. No reviews found. If you have recently stayed in this holiday home please leave a review, it only takes a few moments and will really help future guests when they are searching for holiday accommodation at Kingfisher Holiday Park.